Keyword ssnotime53 -There is no time limit. You can play this challenge and upload yourproject at Splitcoastand/or your Blog, anytime at all! You (and that means anyone and everyone, blogger or not! )can play as many times as you like!!! The point is to keep it simple, quick and have fun!!! Please link back here. What I see when I view Jennifer’s work are projects that are very clean and fresh, often withcutsie type images, but alwaysdone with total class!!! I like that!! !Jennifer’s work is very delightful and refreshing and her fun-loving spiritshines through many of her projects. Jennifer also does a fair amount of 3-D or alteredprojects, so if you’re inclined to do a 3-D project for today, that works!!! So the basic list for today’s challenge is to make aproject with a Clean Design, Fresh Colors, Cutsie Images, and a Classy Overall Appearance.For inspiration, Jennifer is providingus with some samples of her work, as well asa new creation for today. 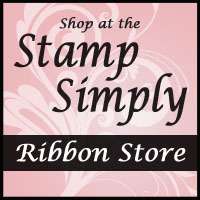 You can check them all out atThe Buck Stamps Here. Andonce you get there, take the time to cruise her blog for even more fabulous inspiration!!! You’ll be pleased you did!!! The above are suggestions, not all requirements the only requirement is that you try to create a project with a clean, fresh and classy feel to it, using Jennifer’s work as your inspiration. HOW you achieve it, is up to you! We cant wait to see what you do!!! If you are viewing this late Thursday night or early Friday morning, please bear with us as everyone is uploading their projects — thank you!!! Check out Julie Koerberssample here. Check out Dee Jacksons samplehere. Check out Jennifer Bucks sample here. Check out Janine Orchards sample here. Check out Tammy Hershbergers card here. Check out Becky Oehlers card here. You can see all Gallery Submissions here. Arent these girls justFABULOUS!!! Thank you girls!!! Much appreciated!!! Every day is a gift — Oh how true! This beautiful bird image (cute and classy all rolled up into one!) is in a set by Inkadinkado called Winter Birds — so many gorgeous, flourishy birds — I just love it!!! I merely stamped my image in black onto white paper, and then it was merely a matter of layering paper — now how EASY can that be!!! I love the clean, crisp feel of the celery, black and white together. And I got to use more of my new May Arts ribbon, which I LOVE. This striped ribbon is 1.5″ wide and is a grosgrain, but its nice and soft for tying — just perfect!!! After my card was all put together, I added a rhinestone eye and traced over the flourishes with a glue pen and applied Dazzling Diamonds, for a VERY dazzling card IRL!!! Hope you have some time this week to play with us and get Cute-n-Classy with JenniB!!! It’s a fun one!!! Wishing you all a wonderful weekend ahead!!! Sharon, This is beautiful…clean & classy. Just got my first Inkadinkado sets yesterday…off to play since sleep is an illusion. This is definitely fresh!! I love that ribbon!! Oh my!! Have a great weekend Sharon!! This is gorgeous Sharon!! Love the color … so crisp! And that ribbon .. WOW! Beautiful card and I love that ribbon. Sharon, this is such a clean, crisp card. I love it and it is so gorgeous! Okay, when you see the other comment, you’re going to think I’ve totally lost it since I commented on that card yesterday! You’re right, I’ve totally lost it!!!!! LOL . . . I love this card as well! I love the simplicity and clean, classy elegance of this design. I’m going to try to play, won’t be til tomorrow though, I’ve got a full day of commitments today. Beautiful card, Sharon! I love those Winter Birds stamps, and I love the color combo on your card, too! Hope I came close to capturing Jennifer’s clean and fresh style! That ribbon is just gorgeous on this bold image! Gorgeous!! Definitely clean and classy! Love the image, the colors and the beautiful ribbon! OK, I’m an early bird today! Here is my card “Little Broom”… I used a cute image but it ended up more Classic than Classy! Oh– and I guess I’ll have to walk around with my fingers crossed one more day–waiting on your guest designer to be announced! Hoping….. SImply fabulous! I love it. That ribbon is TDF!! LOVE the color combo!! Beautiful yet simple card, gotta love it. Those swirly birds are so eyecatching. Thanks for another FUN TIME challenge … it’s always so enjoyable to come by your blog!!! Here is my tribute card to Jennifer: http://www.splitcoaststampers.com/gallery/photo/1059870?cat=500&ppuser=95678 … I hope it’s worthy!! Oh Sharon, this is just adorable. 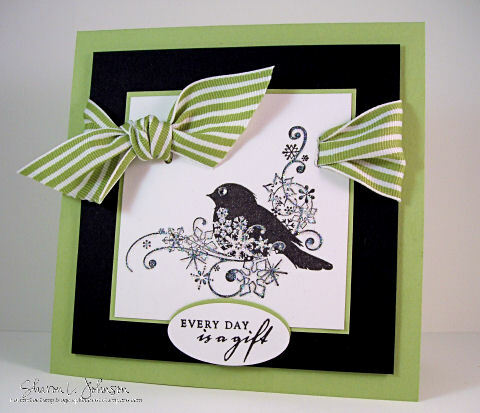 I love the green and black and the simlicity of the card! And, I love that ribbon. You sure are hooking me on these wide ribbons. They sure class up a card! Another elegant design and color combination. I am really going to have to think about your challenge. Such gorgeous cards as examples. OMG–so gorgeous! You and this set were made for each other! I swoon!! Clean and classy? You nailed it here!! WOW!! I love the crisp, clean sketch!! And that black and green combo is STUNNING!! Love this one!! Love it a lot!! WOWZER!! This is so gorgeous!! Love the color combo and that image is fabulous!! I hope to maybe play along!! THANKS!!! Love the simplicity and elegance of the card! Nice colors! Love the ribbon! This absolutely beautiful………..I love the color combination!!!! I love this, Sharon! So clean and fresh! That ribbon treatment is fantastic! I just love this color combo – it really is so crisp and fresh. And that ribbon – well it is just delicious! Mmmmmm, so pretty. Your card is just divine! How cool is that awesome ribbon? WOW!! Sharon, this is so beautiful and elegant! I love it. This is my first time participating I hope it mine is okay. Loved Jen’s blog… thanks for the challenge! I LOVE this, how did I miss this post…love those colors together and what great ribbon. Beautiful card! Just may have to get that stamp set–it is wonderful.